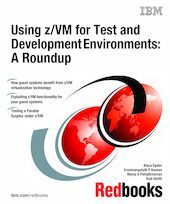 This IBM Redbooks publication shows the strengths of z/VM and how you can use these strengths to create a highly flexible test and production environment. Some of the strengths of z/VM that are shown in this book are that you can run Linux on z/VM, you can run a sysplex under z/VM, and you can develop code under z/VM for z/TPF. You can also provision Linux guests under z/VM. A vswitch allows you to connect all of your guests (all operating systems that run under z/VM) easily to the network. You can simulate your production environment on a sysplex. environment and expand your application development and testing environments.